Review by AllTheBestFights.com: 2017-04-22, spectacular finish between Jake Ellenberger and Mike Perry: it is close to get four stars (UFC Performance of the Night). Jake Ellenberger entered this fight with a record of 31-12-0 (81% finishing rate) and he is ranked as the No.21 welterweight in the world but he won just one out of his last four bouts, against Matt Brown (=Brown vs Ellenberger); after this fight he lost to Jorge Masvidal (=Ellenberger vs Masvidal). His opponent, Mike Perry, has a mma record of 9-1-0 (100% ko/tko victory rate – he has never won via submission) and he entered as the No.50 in the same weight class but he comes off his first and only loss, suffered against Alan Jouban (=Perry vs Jouban). 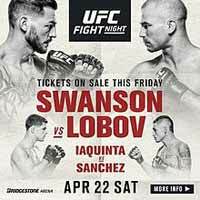 Mike Perry vs Jake Ellenberger is on the undercard of Cub Swanson vs Artem Lobov – UFC Fight Night 108. Watch the video and rate this fight! Review: 2014-08-15, pretty good fight with a spectacular finish: the second fight between Buakaw Banchamek and Abdoul Toure gets three stars. Buakaw Banchamek entered this fight with a professional kickboxing record of 217-21-12 (56 knockouts) and he is ranked as the No.1 super welterweight in the world, he suffered his last defeat in 2009 when he faced Andy Souwer in the semifinal of the K-1 World Max, since then he has collected 30 consecutive wins! He has already fought four times in 2014 beating in his last bout Djime Coulibaly (=Buakaw vs Coulibaly 2). His opponent, Abdoul Toure, has a record of 16-5-0 (7 knockouts), he has already fought once in 2014 but he was beat by Petchmongkong Petchfocus. In their first fight Buakaw defeated Toure in two rounds (August 17, 2012); this second bout is valid for the WBC Muaythai Diamond belt (70 kg). Watch the video and rate this fight! Review: 2014-06-21, nice and tough fight between John Wayne Parr and Toby Smith: it gets three stars. John Wayne Parr entered this fight with a professional kickboxing record of 88-29-1 (40 knockouts) and he is ranked as the No.6 middleweight in the world, he suffered his last defeat in 2010 when he faced Zhang Kaiyin, since then he has won eight consecutive fights. His opponent, Toby Smith, has an official record of 34-6-2ishing rate) and he entered as the No.6 super welterweight, he is just 20 years old (18 years younger than JWP) but he managed to win the WPMF junior middleweight world title and he defeated Thongchai Sitsongpeenong (Lumpinee Stadium welterweight champion) in January. ‘JWP’ Parr vs Smith is valid for the WKA World middleweight title. Watch the video and rate this fight! Review: 2014-04-16, Ryan Jimmo vs Sean O’Connell gets three stars thanks to a spectacular finish (UFC Performance of the Night). The black belt in karate (Chito-ryu) Ryan Jimmo entered this fight with a professional mma record of 18-3-0 (50% finishing rate) and he is ranked as the No.25 light heavyweight in the world, he fought three times in 2013 losing the first bout against James Te Huna (=Te Huna vs Jimmo) then he defeated Igor Pokrajac (=Jimmo vs Pokrajac) but in his last fight he was beat again, by Jimi Manuwa (=Manuwa vs Jimmo). His opponent, Sean O’Connell, has an official record of 15-4-0 (67% finishing rate) and he entered as the No.53 in the same weight class, in this bout he makes his Ufc debut and he comes off six consecutive wins. Jimmo vs O’Connell is on the undercard of Michael Bisping vs Tim Kennedy – UFC Tuf: Canada vs Australia. Watch the video and rate this fight! Review: 2013-10-23, the fight between Yodsanklai Fairtex and Vladimir Konsky gets three stars thanks to a spectacular finish. Yodsanklai Fairtex ranked as the No.1 middleweight in the world, entered the fight with a record of 185-71-4 while Vladimir Konsky had a record of 42-22-1. Yodsanklai vs Konsky is the quarterfinal of the Thai Fight 70 kg tournament. Watch the video! Review: 2013-08-10, good fight with two knockdowns and a spectacular finish: Kem Sitsongpeenong vs Maiki Karathanasis gets three stars. Kem Sitsongpeenong ranked as the No.20 welterweight in the world, entered the fight with a record of 117-22-4 while Maiki Karathanasis had a record of 38-5-3. Kem vs Karathanasis is on the undercard of Buakaw Banchamek vs Dong Wenfei – MAX Muay Thai 3. Watch the video! Review: 2013-06-29, great second round between Mickael Piscitello and Saiyok Pumpanmuang: it gets three stars. Mickael Piscitello (41-21-1) entered as the No.10 super welterweight in the world while Saiyok Pumpanmuang (208-40-1) entered as the No.5. Piscitello vs Saiyok, 70kg muay thai fight of Thai Fight 2013 Bangkok. Watch the video! Review: 2013-04-05, nice and tough fight with one of the best muay thai knockouts of the year 2013: Saeksan vs Stephen Meleady gets four stars! Saeksan Or Kwanmuang, also known as Seksun, (80-37-3) entered as the No.4 featherweight in the world while Stephen Meleady entered as the No.11 super featherweight (we have found two Meleady’s record: the first one 25-7-0 from Muay Thai Warriors website and the second one, 25-9-2, but it is dated July 25, 2012). Saeksan vs Meleady is valid for the Muay Thai Warriors lightweight title. Watch the video! Review: 2013-03-09, nice first round thanks to an aggressive start by both fighters: Corbett vs Sokolowski gets three stars. Nathan ‘Carnage’ Corbett ranked as the No.1 super cruiserweight in the world, entered the fight with a record of 56-3-1 (KOs 42) while Kamil Sokolowski had a record of 40-5-0. Corbett vs Sokolowski is valid for the WKN Muay Thai heavyweight world title; main event of Total Carnage 3. Watch the video! Review: 2013-02-17, after a first boring round, Kritsana Erawan (red trunks) surprises Phetphatam Bermphudin knocking him down with a perfect right hook and trying to close the fight but the heart of a real warrior like Phetphatam never gives up and he starts to throw some vicious elbows… bringing the match to an awesome finish! With a more exciting first round the bout could have got five stars, but anyhow it is one of the best muay thai fights of 2013, four stars! Kritsana Erawan entered the fight with a record of 49-10-1 while Phetphatam Bermphudin had a record of 60-10-0. Kritsana vs Phetphatam was held at Channel 7 Stadium, Bangkok (Thailand). Watch the video!